Jahid (right) talks to Tengku Fuad (second right), Datuk Douglas Lind (third right) and Vanugopal (second left), also seen is Datuk Johnny Mositun (left) outside the teleconference room after the decision today. KOTA KINABALU: The High Court here today dismissed Parti Warisan Sabah president Datuk Seri Shafie Apdal’s application to strike out an originating summons (OS) of Sungai Sibuga Assemblyman Tan Sri Musa Aman, who filed the summons seeking a declaration that he is the rightful Sabah Chief Minister. The decision was delivered by Justice Datuk Yew Jen Kie via teleconference. 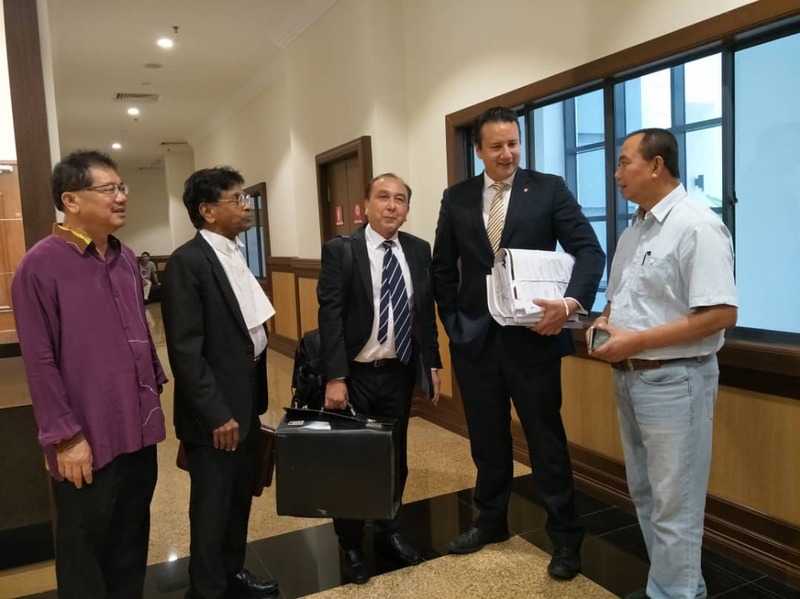 On June 28, Shafie through Messrs Lind Willie Wong and Chin had filed the striking out application to have Musa’s action against him be dismissed on the grounds that Musa’s OS allegedly discloses no reasonable cause of action, scandalous, frivolous, vexatious and it is an abuse of process of the Court. Musa, 67, who had filed the OS on June 6 via e-filling through Messrs F. T. Ahmad & Co, had named The Head of State (TYT) and Shafie as the first and second defendants, respectively. State counsels Dygku Fazidah Hatun Pg Bagul and Zaleha Rose Pandin acted for TYT while Tengku Fuad was assisted by counsel Suku Vanugopal. Meanwhile, the same court also dismissed the striking out application by Shafie against Datuk Jahid Jahim, who is Tamparuli Assemblyman, that had filed his OS, to seek a declaration that Musa is the lawful Sabah Chief Minister. Jahid @ Noordin, who was one of the Cabinet Ministers in the first sworn-in Sabah cabinet under Musa, named Semporna MP Shafie, the Speaker Datuk Seri Syed Abas Syed Ali and Sabah State Assembly secretary Datuk Bernard Dalinting, as the first, second and third defendants respectively.